Are you looking for a similar live chat software to Intercom? With the plethora of live chat software solutions available, we’ve compiled the 10 leading products with robust features for real-time messaging and sales and marketing capabilities. What are the top 10 alternatives to Intercom? The way people communicate has changed over the past years. Before, if a customer wants to contact support, they have two top choices: email or phone. However, neither is very efficient, especially for customers. An email usually takes a few hours and minutes for a customer to receive a response while a phone call consists of a series of prompts, buttons to press, and waiting time. These can frustrate and drive a customer away. That is why businesses are leaning towards live chat tools to fill in this gap. With a faster, and almost instantaneous, response, customers prefer live chat as it’s convenient and helpful for decision-making. Additionally, it can also help you get more leads and increase sales. With all these benefits, it’s easy to see why live chat is seen to play a key role in the growth of eCommerce businesses in 2019. A HubSpot study conducted in 2018 has revealed that consumer patience is good for just up to 10 minutes. The same survey observed that 82 percent of consumers put great importance on immediate response when it comes to making a sales or marketing inquiry. 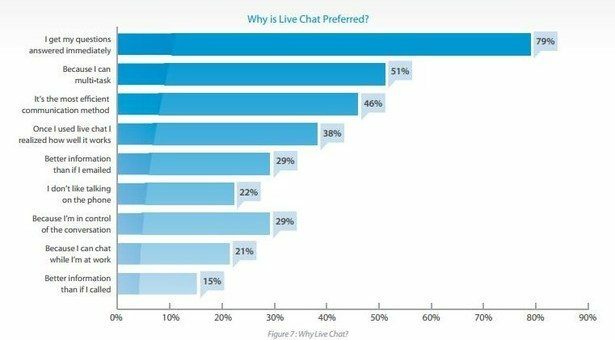 While these statistics are valuable reasons why you’re considering to implement a live chat solution, it’s also important to note that simply getting a live chat software is not enough. Choosing the right software and using it correctly are crucial to ensure you get effective and successful results. As the demand for live chat increased by 8.29% as per LiveChat’s Customer Service Report 2018, the study discovered many SMBs are struggling to keep up with the demand. This stresses the importance of finding a solution that solves your organization’s specific challenges as they vary from one business to another. For instance, you may need to build a knowledge base or implement a chatbot for your FAQs (frequently asked questions) to manage your tickets efficiently. Meanwhile, another may need to prioritize personalization in handling their messages. You may also utilize creative ways to use live chat for sales. If Intercom is one of your top choices, we’ll proceed with getting to know the software better first before exploring the top 10 alternatives to Intercom. Intercom is a customer platform designed to help businesses drive growth by delivering a unified solution all throughout a customer’s lifecycle—from acquisition to engagement and support. It offers internet businesses a suite of messaging-first products for your sales, marketing, and support teams. For its live chat solution, Intercom has Live Chat for Sales which uses messenger apps and bots to capture more leads. Despite the use of a bot known as “Operator,” the system ensures to keep the conversation flow “human” while qualifying a visitor automatically. Having this solution for qualifying prospects reduces the friction between sales and marketing teams and leverages the process of lead generation. Its live chat solution has four main phases: capture, qualify, convert, and measure. Each of them packs features to properly respond to customers differently based on various factors such as where they came from, how they qualify themselves, and what pages they visited, among others, instead of treating all conversations as a completely automated funnel. Some of its key live chat features include visitor targeting, A/B testing, qualification and routing, lead routing, and meeting scheduling. Intercom also has a library of integrations and APIs to fit the system with your existing workflows. Targeted messages. This feature enables proactive engagement with your customers by targeting visitors based on their referral URL and browsing behavior. You can also integrate with systems such as Clearbit Reveal to leverage visitor targeting based on location and company size, among others. A/B testing is available to check the effectiveness of your messages. “Operator” bot. Operator, Intercom’s bot, automatically qualifies your new leads coming in from your website and mobile apps and then routes them to the right succeeding step. For instance, it only routes sales-ready leads to your sales team. It also provides a 24/7 automated meeting scheduling. Fast-track conversion. When qualified leads come in, the system immediately connects them to the right team or department. The lead routing feature directly auto-assigns leads or through an RR (round-robin) algorithm according to, for example, location and account owner. You can also send personalized pricing offers (via Stripe app) and start a call with hot leads (via Aircall and Google Meet apps). Personalized drip campaigns. A study conducted by the Institute of Applied Informatics of Leipzig in 2018 showed the positive effects of live chat on customer trust, satisfaction, and repurchase. This calls for the importance of personalization in customer service. Hence, adding leads to a personalized drip campaign and sending personalized messages are crucial for lead conversion. Performance Measurement. Measuring the performance of your live chat is crucial for your sales and marketing teams. It shows you insights such as the leads captured over a period of time, response rate, messages that generate the most leads, and the number of leads sent to sales teams. These types of information can help you improve your strategies and process and eliminate bottlenecks. Intercom is packed with powerful features. At the same time, we understand it may not fit all your business requirements. If you’re looking for similar options, here are the top 10 alternatives to Intercom you can check out. LiveAgent is one of the top choices when it comes to a helpdesk solution as it packs live chat, email, and social media support on a single platform. This simple and intuitive system comes in an easy to learn, use, and implement system while packing a robust set of features to leverage the quality of your customer service. If you’re interested to check out LiveAgent’s features and offerings firsthand and at no cost, you may sign up for LiveAgent free trial here. Its built-in, real-time live chat solution comes with automated invitations on its messenger widget. This product’s top features include real-time typing view, chat history, chat distribution, and proactive chat invitations, among others. It shows a real-time overview of chats and your visitors—who of them are chatting, who are waiting in the queue, and who are browsing your website. The chat buttons come in pre-made options and customizable ones which you can easily place anywhere in your site. If you want to create your button, you can write your own HTML code or upload an image. It also offers customer feedback and drag-and-drop capability for files in the chat. If it doesn’t match your requirements, you may also look at LiveAgent alternatives. Why choose LiveAgent instead of Intercom? Ring-to-all feature. To lessen the waiting time of customers, it enables advanced chat routing by ringing all available agents until one of them picks up. Automatic live chat invitation. Custom URLs are used to invite customers for a live chat for engagement while staying relevant according to their browsing activity. Chat and visitor overview. Real-time insights of a visitor’s activity, including how much time they spend on a specific page and what they are browsing, to leverage how your agent responds when chatting. Why choose Intercom instead of LiveAgent? Messenger bot. It uses a bot called Operator in qualifying leads automatically before routing to agents. Meeting scheduling. Automatically schedule a meeting with sales team 24/7. A/B testing. Measure and optimize the performance of your solution through A/B testing. Zoho SalesIQ is a live chat software solution used by small and large companies in engaging customers and extracting valuable statistical data. The proactive messaging system enables you to connect with your customers in real time to help you increase the ROI of your email marketing efforts, Adwords, SEO, and content. On top of its live chat solution, the platform also provides you with website tracking and analytics features. You can send customized messages to your prospects and customers effectively. As it directly integrates with other products and apps of Zoho, it lets you streamline how you facilitate data transfers to maximize the potential of each particular action involved in customer service. If you want to explore more options, here are some Zoho SalesIQ alternatives. Why choose Zoho SalesIQ instead of Intercom? Zoho CRM integration. By having a direct integration with Zoho’s CRM module, you can extract actionable insights, identify prospects, and track visitor’s activities in your site. On-the-go solution. It is available on desktop and mobile through Mac, Windows, Ubuntu, and SDK. Real-time lead scoring. It identifies hot, warm, and cold leads so you can prioritize prospects accordingly and convert them into proactive customers. Why choose Intercom instead of Zoho SalesIQ? “Operator” bot. It automates the qualification of leads before forwarding them to the next agent. Messenger visibility. You can choose the visibility of Messenger to whom, where, and when. Visitor targeting. Use Clearbit Reveal data, referral URL, and browsing data to target visitors. Freshchat is developed for sales teams to have a proactive mobile messaging and customer engagement solution. It shares a great similarity with Intercom as both are built for sales teams. This modern messaging software is an addition to Freshworks’ prominent solutions suite. It specializes in bringing customer conversations on a personal level through chat and adjusting them according to you and your customers’ expectations. The preparation and distribution of contextual messages are optimized in the system. Additionally, it streamlines how you capture leads and qualify resources. In gathering valuable customer intelligence, you may collect them directly or use third-party applications. This product enables you to engage existing customers and educate new visitors through in-app campaigns. There are also Freshchat alternatives worth checking out if it doesn’t suit your preferences. Why choose Freshchat instead of Intercom? Contextual conversation. Let your agents know who they’re talking to by having access to user information, social profiles, events timeline, or pull up more information from external apps. Launch campaigns. Whether it’s for onboarding new users or retaining existing customers, you can set up a campaign for delivering announcements, gathering feedback, or sharing tips. Centralized platform. Collect all conversations across channels such as your website, mobile app, in-product, or social messages in a single platform. Why choose Intercom instead of Freshchat? Lead Routing. Use RR (round-robin) algorithm according to location and account owner or auto-assign leads to the right agent. Stripe integration. This integration lets you send personalized pricing offers while chatting. Messenger visibility. You have control of where, when, and to whom the messenger is shown. Kayako, a cloud-based help desk software, offers live chat among its support channels for your customers. It helps companies have a unified solution in managing customer requests and conversations while staying personal. Additionally, it searches for relevant insights from customer queries, support bottlenecks, sales and trends opportunities, and performance metrics that you can use to improve your processes. Live chat forms are customizable so you can tailor it according to your workflow and branding. You can launch it across your website to address customer concerns or generate leads proactively and in real time. It also allows your agents to handle multiple conversations at once. Additionally, its live chat is on mobile too which you can embed on your mobile app for mobile messaging and in-app support. Meanwhile, here are Kayako alternatives if you’re looking for other similar options. Why choose Kayako instead of Intercom? Continued conversation. When customers return, the conversation won’t restart. Instead, it will continue and pick up where it’s left off. Custom chat windows. The live chat interface is highly customizable for message title, welcome message, background color, and primary color. Kayako Messenger home screen. It provides the right answer from the home screen by delivering the right content at the right time. Why choose Intercom instead of Kayako? Live chat performance. Measuring the performance of your live chat is streamlined. Robust integrations. It fits with your existing workflows through APIs and its library of integrations such as Salesforce, Slack, and Clearbit Reveal, among others. Qualification and routing. Leads are automatically qualified and routed to the right sales team. Drift is a conversation-driven live chat messaging solution designed for sales and marketing teams. This conversational marketing platform enables you to manage multiple interactions on a scale. It paves the way for creating seamless conversations across your channels whether it’s on live chat or email. It streamlines how you identify prequalified leads, offer the right response, and schedule a sales call. Its dashboard gives you visibility over how your interactions impact the performance of your business. It shows a comprehensive overview of the number of interactions with each lead, meetings they scheduled, and the longevity of when the conversation was handled. Like Intercom, its chatbots automatically qualify leads on your website 24/7. If this product doesn’t match your requirements, here are Drift alternatives to consider. Why choose Drift instead of Intercom? Leadbot. Drift’s bot, Leadbot, is a conversational bot built to ask your qualification questions and generate leads. Sales and marketing. This offers specific solutions each for sales and marketing teams. Mobile and browser apps. Teammates can share conversations and leave notes to ensure everyone gets the same context. Why choose Intercom instead of Drift? Operator. Intercom’s bot that qualifies leads and routes them to the right agent automatically. Clearbit integration. A direct integration that enables you to pull up information about a visitor’s location and company size, among others, to enhance visitor targeting. A/B testing. Leverage the performance of your targeted messages by testing variants. Considered as one of the pioneers and market leaders of real-time customer engagement, LivePerson continues to deliver agile solutions in aggregating, managing and optimizing messaging across multiple digital channels since two decades ago. It also revolutionizes customer care through its mobile messaging and voice call solutions in addition to its live chat solutions. LiveEngage, LivePerson’s popular messaging platform, enables businesses to communicate with their visitors on websites, mobile apps, and social platforms in real-time. It equips a plethora of features from routing to tracking and reporting. This open platform offers built-in automation and AI that enables you to utilize your interface to match your workflows seamlessly. We also compiled some LivePerson alternatives you can check out. Why choose LivePerson instead of Intercom? Hot Topics. A specialized text analytics that identifies topics repeatedly talked about by customers. Meaningful Connection Score. During real-time conversations, this identifies customer sentiments effectively. This algorithm can be used alone or along with traditional CSAT methodologies. Chatbots and AI. It lets your agents work alongside bots under the same conversation window for bots take care of repetitive process and humans to focus on engaging customers. Why choose Intercom instead of LivePerson? “Operator” bot. Intercom’s bot handles the automated qualification of leads before routing to your sales team. Hot leads. You can start a call with hot leads through integration with apps such as Google Meet and Aircall. Messenger visibility. Choose to whom, when, and where to show your messenger. Stride, a chat and messaging platform, offers a full team communication solution that’s equipped with smart features and best elements from HipChat, the former product where Stride is re-engineered from. It has been added with new features in addition to the essential chat and messaging solutions. Some examples include a function called Action and Addition where tasks can be isolated and assigned to “to-do” messages. It is worth noting that Stride is built for group messaging and video meeting for teams. It currently doesn’t offer a live chat room for guest access. This means if you want to add customers to your live chat, they will have to go through registration first. Hence, this solution is suitable for organizations looking for a messaging and chat solution to improve communication and collaboration within their team. It’s added to the list due to its similar robust messaging solutions with Intercom while offering a unique solution for variety. Meanwhile, here are some Stride alternatives worth checking out. Why choose Stride instead of Intercom? Group chat and direct messaging. This is personalized based on your workflow and customizable with image annotations, custom apps and bots, and message formatting. Voice and video conferencing. Built right into the platform, you can invite anyone on your team and outside of your team by sharing a URL to start the video conferencing without downloading anything. File sharing. No need to leave the chat while sharing files to stay in context. Why choose Intercom instead of Stride? Live chat for sales. It lets you capture leads, qualify them automatically, and move towards conversion. Chatbots. The chatbot, Operator, automatically qualifies leads before routing them to your sales team for scheduling a meeting. Visitor targeting. Use referral URL or browsing behavior of a visitor to target your messages. Olark is a live chat software that enables you to transform your customer service to an opportunity for growing your business. It has three main approaches: increasing sales, providing support, and acquiring leads. Flaunting a clean and intuitive design, this simple platform enables you to leverage your customer engagement in real time through proactive chat sessions. This solution ensures you make each conversation counts. Hence, its features such as custom pre-chat surveys, detailed visitor insights, automated messaging, and comprehensive reporting let you determine and engage your most qualified leads. To maximize your processes, it allows you to connect and send your data with third-party applications like ecommerce, CRM, and analytics, among others. There are also Olark alternatives if it doesn’t match your requirements. Why choose Olark instead of Intercom? Unlimited conversations. For its paid plans, there’s no limit in chat volumes and number of conversations, no matter how high they are. Automated messages. Through a visitor’s behavior in your site, you can automate messages to streamline delivering the right message at the right time. Real-time reporting. Reporting of chat volumes, busiest time and day, agents with the highest volume of chat messages, customer rating are generated in real time instead of refreshing daily. Why choose Intercom instead of Olark? Stripe app integration. During a chat session, you can send personalized price offerings to empower conversion accordingly. Personalized messages. By adding leads to drip campaigns, you can streamline sending personalized messages. If you’re looking for a live chat solution with video recording, Smartsupp is a good place to start. This real-time solution alerts you with notifications when a visitor on your website sends a message so you can respond in a timely manner. It also records the screen of your visitors to get a better grasp of their behavior based on their clicks and mouse movement in your site. It also offers mobility. Even while you’re on the go, you can respond to customers through your Android or iPhone. It is also highly customizable according to your web design. When it comes to tracking the impact of conversion rates and customer behaviors on sales, you can use Google Analytics seamlessly. Here are some Smartsupp alternatives you may also look at to explore more options. Why choose Smartsupp instead of Intercom? Video recording. It records your visitor’s screen to offer more insight on their behavior on your website. Automatic messages. Send personalized messages to your visitors by setting up your own custom rules. Measure performance. Google Analytics helps you track and measure the impact of customer behavior and conversions on your sales. Why choose Intercom instead of Smartsupp? Operator chatbot. Operator is an intelligent bot that streamlines and automates the qualification of leads before routing to sales agents. Messenger visibility. If you want to take control on where, when and to whom you can show your messenger, you can do so in the platform. A/B testing. Test variants to leverage the performance of targeted messages and optimize your strategies. ProProfs Chat completes the list of top 10 alternatives to Intercom. This live chat solution enables you to use pre-defined greetings and messages or create a custom message with the platform’s library of pre-built templates. By streamlining these processes, you can quickly focus on addressing your customer’s questions and responding accordingly. Anticipating a customer’s message is also optimized as your agents can see what the customer is typing even before they send the message. Operator to operator chat is also available. This is essential, especially for new agents to connect with experienced executives during a chat session so they can offer intelligent and prompt responses. If it doesn’t match what you’re looking for, you may check out these ProProfs alternatives. Why choose ProProfs Chat instead of Intercom? Quick implementation. To add this system, you only have to copy and paste the codes which work on any browser and device. Branded chat windows. Customize chat windows based on your branding by using your own colors and logos or ready-made chat templates. Visibility over customer activity. See what the visitor is viewing on your website and what they are typing even before hitting send to offer a relevant, appropriate, and timely response. Why choose Intercom instead of ProProfs? Automated lead qualification. Qualifying leads is automatically accomplished by Intercom’s chatbot. Targeted messaging. Respond with a targeted message according to the visitor’s browsing behavior, referral URL, or information such as location and company size. Personalized pricing offers. Convert leads by sending them a personalized pricing offer using an integration with Stripe app.